Ok, I realize the concept of bath salts has been getting a bad rap as of late, ever since weirdos in Florida started smoking them and eating people’s faces off. But ACTUAL bath salts, the kind you soak in, are freaking awesome. Combine the benefits of essential oils with the benefits of salt in your bath water and you have a recipe for mindfulness, muscle recovery, stress relief, improved circulation, and a headache solution. This is a really simple DIY that you can adapt based on your favorite colors, scents, and containers to customize to your liking. Make a huge batch and you’ll have an arsenal of gifts you can break out at a moment’s notice. Not to mention, during the process, your house will smell amazing! I packaged this batch in mason jars because DUH! and I love mason jars (I also wanted to decoupage the tops for some added flair) but I think these, these or these would work well too. 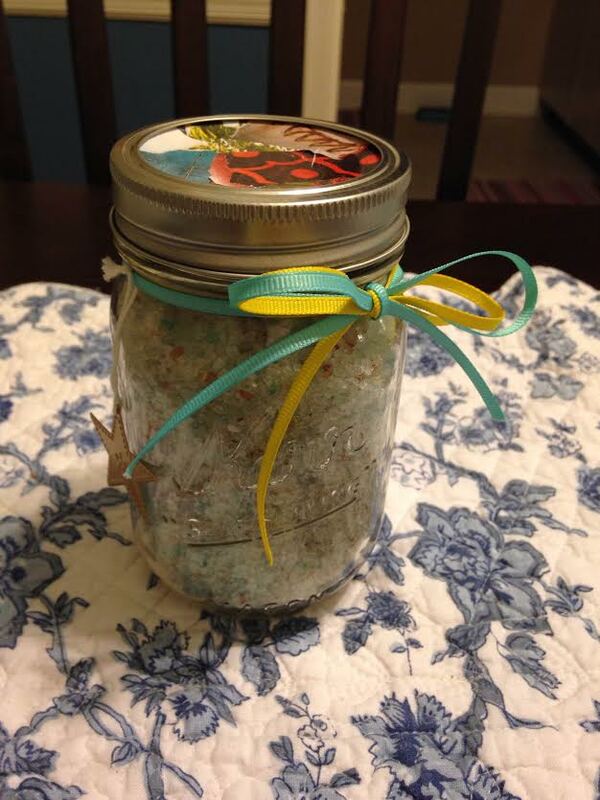 You could even be super thrifty and reuse cleaned out food jars. -Mix one cup of epsom salt and one cup of sea salt in a large mixing bowl. -Add 3-6 drops of food coloring. Mix and add more until you reach your desired hue. -Set the bowl aside and pretty up your mason jar tops by decoupaging a tiny collage on top. -Spoon your salts into the jars and throw the top on. -Tie a small charm or gift tag/label around the jar with your chosen ribbon/s. Voila! You’re well on your way to giving someone the gift of stress relief and a proper pampering.